Q: I haven’t exercised in a long time (or hiked… ever!). Will Mountain Trek be too hard for me? Will I be able to keep up? We will challenge you – make no mistake about that! But the great thing about being a boutique program with no more than 16 guests and a 4 to 1 guest-guide ratio, is how personalized your experience can be. You get to work at your own pace. Based on your fitness level (which will increase during your stay, we promise), your energy level that day and the kind of hiking we’ll be doing, you join a small group of people who hike at your level. You’re never left behind and there’s no pressure to perform. On the other hand, if you’re raring to go, we have a group for you too. At Mountain Trek, you will always be treated as the unique individual you are. Q: I’ve seen the pictures of your “back country” and “wilderness” hikes. The landscape is breathtaking… but will I be safe out there? Yes, absolutely, you will be safe. 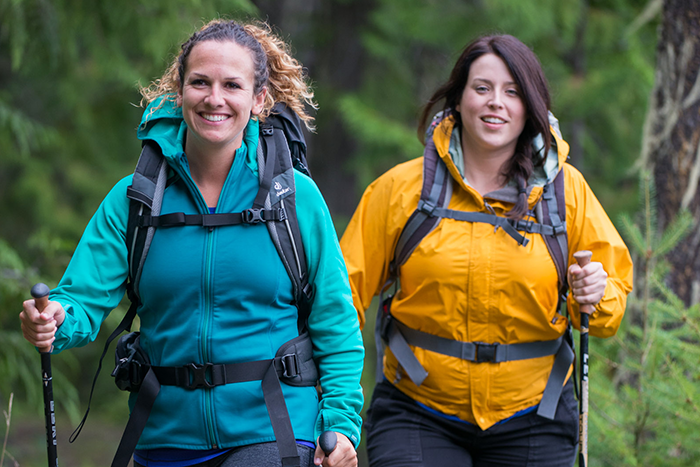 All of our hiking guides are Wilderness First Aid certified; several have spent decades as Canadian park rangers, exploring, mapping and caring for the very territory they will be guiding you through. All of the guides know the trails, know how to read the land, know what to expect and are trained to deal with the unexpected. Q: I’ve been to resorts where you’re faced with dozens of choices every day. It’s stressful to have to plan everything for yourself. What is Mountain Trek like? We agree, too many choices can stress you out. When you come to Mountain Trek, you relax and put yourself in our hands. We create a schedule of activities every day that develop your cardio, strengthen core muscles, stretch the body and bring you to a new level of fitness. You don’t have to plan, juggle, create to-do lists, figure out what activities make sense or in what order. We take care of that. You focus your energy on yourself and your health. Q: And speaking of spa vacations for women, when I’ve gone to other places, I’ve sometimes felt it mattered that I looked like, whether my hair was in place, my make-up “done.” What about Mountain Trek? Glad you asked. We are Casual with a capital C. There’s no need to worry about appearances. You are free to be yourself – whatever you want and need to be. With our maximum of 16 guests (who are all focused on the same personal change), and compassionate staff, the chances that you will feel judged are very small. Q: I have food allergies and sensitivities; I am particular about my food. Will you accommodate me? Absolutely. Before you arrive, we send you a questionnaire that asks about just these things. Our dietician and chefs read over each questionnaire and make sure that every meal served to you fits your distinct needs. Q: I’m taking medication. Is that a problem? If your doctor doesn’t think it’s a problem, we don’t either. We want you to check in with your health care provider and tell him or her all about Mountain Trek and your decision to pursue a path to renewed health and vitality. And we’ll want to know about your medications (you list them on the intake questionnaire). However, we are an intimate, individualized program. We cater to who you are and we’ll keep a careful watch. “When I had first left Mountain Trek after my three weeks there, transitioning to home life was more difficult than I had imagined. I felt somewhat overwhelmed by the reintroduction of stressors and choices in my life. That said, I was very prepared for it all by the excellent discussions and classes we had. I kept hearing Cathy and Kirk’s voices in my head reminding me to keep it simple. Focus on one change a week and making myself a priority. I have continued to keep salt off the table and out of the kitchen. And I have refrained from any sugar and white flour products. Diet coke has been a small struggle but Rome wasn’t built in a day. I have made the gym and walking an absolute priority in my life. I have kept my weight loss at 1-1.5 lbs a week so I’ve lost another 15 pounds back home (total weight loss since signing up for the program is 55 lbs). When flying back from New Hampshire I commented to my daughter that I wanted to fly Delta from now on because the seats were larger. My daughter pointed out that the seats were actually the same size and that it was me who had gotten smaller. I realized, as I reached around myself I the airplane seat, that I am smaller. I think that has been one of the more difficult adjustments – seeing myself as the outside world sees me. I spent so much of my life as one person and another person is slowly emerging. It isn’t about the weight but what was buried beneath the weight – physically and emotionally. Mountain Trek gave me the strength and the tools to look underneath at what the real issues were.